UFC 185 opens the curtains and gives you a warm Welcome to the Show with two title fights, a pivotal Welterweight tilt, colossal Heavyweight clash and much more, as Anthony Pettis tops the bill taking on possibly his toughest challenge to date, Rafael dos Anjos. While in the co-main, Carla Esparza makes her first defence of the Women's Strawweight Championship, after former Welterweight kingpin Johny Hendricks meets Matt Brown to potentially determine the future contender. As the UFC welcomes in a huge run of cards to continue 2015, it's one that the World will have their eyes on. Here, we preview the main card fights with breakdowns on skills, offering predictions—as MMA Genius tests his knowledge against Bart, the "Predictor"—and all the stuff you need to know including some betting tips. Striking Advantage: Cariaso is the typical southpaw fighter with a good straight left and a nice high kick. Although Cejudo is a world-class wrestler, he showed a excellent standup arsenal against Dustin Kimura in his debut. He showed great fluidity and combinations as he picked apart his opponent. Cejudo can use the threat of the takedown and level changes to keep Cariaso guessing, therefore giving him the advantage in my opinion. Cariaso can hang, but he struggles when guys stay in his face and push him back. Advantage goes to Cejudo. Grappling Advantage: Cejudo definitely has the advantage on the ground. Although we didn't see it in his debut, we have to respect his wrestling pedigree with that Olympic gold medal. Cariaso has decent grappling ability if he can get on top, but not so much from bottom position. He has been submitted before by two of the best flyweights in the business in John Moraga and the champ Demetrius Johnson. Advantage goes to Cejudo on the ground forsure. Breakdown: Henry Cejudo is getting a good step up in competition after his debut. He should win this fight, but a huge factor to take in is the weight cut for Cejudo. This will be his second attempt trying to make 125lbs after a failed first attempt. If he does have a bad weight cut we could see him fade in the last round. Cariaso is coming off his disappointment title loss to Johnson, and Cejudo is the perfect opponent to make a statement against. This is a also a chance for Cejudo to show that he is one of the brightest prospects in the UFC. With an impressive victory he can be rushed into a big fight at 125. I expect Cejudo to mix it up with a lot of level changes and I think Cariaso wants to fight Cejudo at a long distance. Prediction: As long as the weight cut is successful, I see Cejudo being too much for Cariaso. Cejudo has more ways to win the fight. Cejudo by unanimous decision. Bart: I believe Henry Cejudo will defeat Chris Cariaso. Cejudo has decent standup, but amazing wrestling. If he's not having success against Cariaso on the feet, he'll take the fight to the mat. Cejudo will be better anywhere the fight takes place. Striking Advantage: Overeem definitely has the advantage. Overeem has vicious power along with nasty body kicks and knees. The only negative things about his standup is he tends to drop his hands and his chin has had a lot of problems recently. We all know Nelson has the ability to put any man to sleep with one overhand right, but his striking is just limited to punches and the timing of that overhand right. Roy struggles when guys stay at a distance and accumulate punches on him. Roy tends to get really tired fast if he can't connect early. Grappling Advantage: If you take a look at credentials Roy would have the advantage on the mat, but he rarely ever uses his grappling in fights. Overeem doesn't have a belt rank, but he has submitted black belts before. He also has a very good top game and good ground and pound. I don't think Nelson can take Overeem down, and I doubt he can submit him either. All in all, I say the grappling is about even. I doubt this fight hits the ground for any serious amount of time. Breakdown: Roy is coming off the vicious KO loss to Mark Hunt, and Overeem finally got back on track with a dominant TKO victory over Stefan Struve. A win for either guy puts them back into the title picture. It's a pivotal fight for both men in their careers. I wouldn't be surprised if Overeem got cut if he lost by KO, and at 38, Nelson's window is closing. As for gameplans, I expect Nelson to stick to his typical gameplan, and try to land his overhand right and test Overeem's questionable chin. I expect Overeem to be really cautious and keep this fight at a distance and blast Nelson with body kicks and knees from the outside. Prediction: Although I would love to see a Nelson KO, I just think Overeem is a bad matchup for him. I expect Overeem to get a 2nd round TKO. Bart: I believe the camp of Jackson/Winklejohn is going to have Overeem ready for Nelson. Overeem will keep his distance to pick Nelson apart. Overeem may throw in a takedown or two, because Nelson won't submit Overeem. As long as Overeem stays away from Nelson's over hand right, Overeem cruises to a decision victory. Striking Advantage: The standup portion of this fight is interesting. During Hendricks' initial run towards the title, he showed massive power in his left hand and the ability to KO any man in the 170lb division. Hendricks has had some weight problems and injuries recently leading to the demise of his full potential recently. He added some nice leg kicks to his game before the first Lawler fight as well. On the other hand, Brown has an excellent straight right hand and throws excellent strikes in the clinch. He uses his knees and elbows beautifully when in the clinch. Brown is at his best when he charges guys and get's in their face, but that is against non-elite competition. He couldn't charge Lawler in their fight, because there was good chance of him getting countered and finished. With Hendricks, he cant charge in recklessly because Hendricks will be waiting to time a takedown. Another thing to pay attention to is Brown has showed that he is pretty weak in the body. He has been hurt by Wonderboy, Mein, Silva, and Lawler in the body. I am positive Hendricks will be looking at his ribs like a steak. With all that being said, I give the power edge to Hendricks, clinch striking to Brown, but overall standup advantage goes to Hendricks. He has the ability to neutralize Brown's aggressiveness with a takedown. Breakdown: Both guys are coming off losses to the champ Robbie Lawler, and a win will put them right back into top contender status. I expect Hendricks to be really aggressive and prove that he is the true champion at 170, that I personally believe he is. As for game plans, I think Hendricks will actually get back to his roots and utilise his wrestling. Brown, on the other hand, probably wants this fight to be a brawl and as chaotic as possible. Brown shines in bloody wars. The only question is how is Hendricks' cardio and weight cut, because Brown does not get tired. Prediction: I like Hendricks via Unanimous Decision. I think Brown will have his moments, but Hendricks' wrestling will be too much to overcome. Bart: This is a tough one. I believe Hendricks will be victorious over Brown. If this was a five round fight, I would lean towards Brown, because of his ability to push a furious pace. Hendricks will be able to fight at a good pace against Brown, and should be able to take Brown down at will. Watch for Hendricks to attack the body of Brown. But, in the end, I see Hendricks using his wrestling to win a decision. Striking Advantage: Joanna has a huge advantage on the feet. Out of all the 115lb fighters I have seen compete in the UFC, she has the best standup arsenal. Joanna is also a former world Muay Thai champion. She has big power for the weight class, and I think Carla wants nothing to do with Joanna's standup. Carla's standup isn't the best and very simple and rudimentary. Carla mainly throws basic punches to set up her phenomenal wrestling. Breakdown: This is the first title defence fight in the women's 115lb division. Not too many people know about Joanna, but she is a definitely a game and ready opponent. Carla derailed the Rose Namajunas hype train in her fight and is looking to build more success as the champion. This is the typical striker vs grappler fight, and this will be a close contested fight. Prediction: I think a lot of people are underestimating Joanna. I think Joanna will hurt Carla the longer the fight stays on the feet. Carla will get some takedowns and push Joanna against the fence to stay ahead on the scorecards. Joanna will have her moments as well. I think Carla will win by split decision. Bart: Esparza wants nothing to do with Jedrzejczyk's striking. Look for Esparza to get the takedowns early and often. Esparza will be looking to tire out Jedrzejczyk on the ground and get the submission late in the fight. Jedrzejczyk has a punchers chance, but I don't see her knocking out Esparza. Esparza defeats Jedrzejczyk via rear naked choke in the 4th round. Striking Advantage: Pettis has the edge on the feet, but RDA won't be scared to stand up with Pettis. Pettis' body kicks are vicious and can take any man's souls. We all know about the flying kicks and knees that Pettis throws and he is the one of the most unpredictable strikers in the UFC. RDA, on the other hand, doesn't possess the same flashiness that Pettis has but he is a very sound and precise striker. When he first entered the UFC, he virtually had no stand up ability, and it is amazing to see how far his game has improved. RDA is the only man to ever knock out Ben Henderson and he outstruck an excellent striker in Donald Cerrone. He also has very fast and hard leg kicks. Pettis should have the speed advantage, but RDA isn't that far behind. I think the standup portion of this fight is closer than people think, but all in all Pettis has the advantage due to his unpredictability. 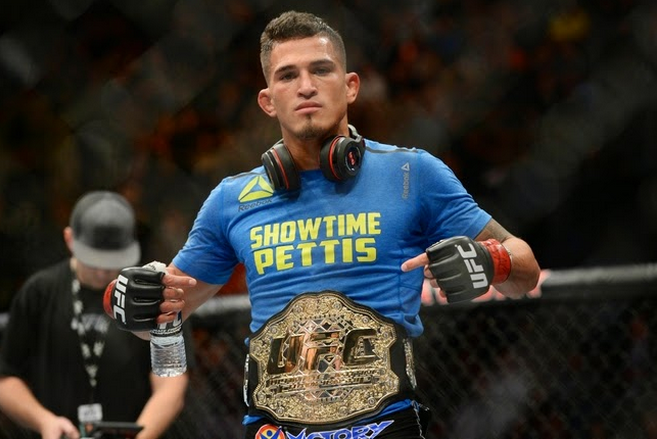 Pettis has never been rocked in a fight or in any kind of trouble, but I think RDA is the best striker he has faced so far. Grappling Advantage: This is where the fight gets interesting. Pettis is so flashy because he isn't scared to get taken down. His guard is so active and he immediately starts attacking with submissions. RDA is one of the best grapplers in the divison. He has very underrated wrestling, and has never been submitted in the UFC before. He has a excellent understanding of basic fundamentals generally giving him the advantage. The only time he has had trouble is when he fought Khabib, but no one has been able to get up when Khabib takes them down. I say the grappling is about even. Pettis doesn't mind being taken down, but I don't think either guy can submit each other. Breakdown: This is the fight I have been waiting for! I have been saying RDA is one of the most under looked and underrated guys in the division for awhile now. I think this will be Pettis' toughest test to date and I think he knows that as well. RDA can do it all, but so can Pettis. In my opinion, Pettis is the best capitalizer in fights. He dives on things the second he gets the chance. As for game plans, I think RDA won't be scared to standup with Pettis, but I do think he will shoot for a takedown at the end of the round. Pettis really doesn't ever fight with a gameplan, but he knows where he excels at. Prediction: I am going on a limb here. If you don't know, I am one of the biggest RDA fans out there and I believe he will shock the world and get the job done. I am not discrediting any of Pettis' skills, but I believe RDA is a bit more of a complete fighter. I think he will get takedowns to stay ahead on the scorecards, and the standup portion will be fairly evenly matched. I guess you could say I am biased, but I am just a loyal fan. I know Pettis has the ability to finish this fight at any time, but I think it is Dos Anjos' time. RDA via unanimous decision. Bart: I like Pettis in this fight. I think it'll be competitive early, but in the end, Pettis will be too much for Dos Anjos. It'll be a striking affair most of the fight, with Dos Anjos managing a takedown or two here and there, with Pettis being able to bounce up quickly. Dos Anjos has the striking power, but Pettis has the speed and technique. I see Pettis getting the KO finish late in the 3rd round. Pettis defeats Dos Anjos via KO in the 3rd round. 1 unit = whatever you can afford $10, $50, $100, etc. Only gamble what you can afford to lose. TheSportMatrix is not responsible for any betting that takes place and these are solely just tips. So that's that - you're geared up for UFC 185 with our experts' takes, some tips to take to the bank, and predictions. Anthony Pettis is the current king of a talent-crowded Lightweight divison, but is that about to change? Can the upcoming Rafael Dos Anjos—after sweeping past former Champion Benson Henderson, before taking out Nate Diaz—topple him from his throne? And, as she prepares to make the first defence of the Strawweight Championship, is Carla Esparza about to continue more history? Or will her dreams be halted by Jedrzejczyk? In the Welterweight division, will Johny Hendricks re-align himself to a third meeting with Robbie Lawler? Or, can the "Immortal" punch his way to contendership? Moving well up to Heavyweight, who out of Roy Nelson and Alistair Overreem will be able to set the tracks for their journeys? So many questions. Only one way to find them out. So buckle up, as the UFC says Welcome to the Show in emphatic fashion through the lights, camera and action of UFC 185 on Saturday 14 March. We'll also have live coverage of UFC 185 on the night, so stay tuned. 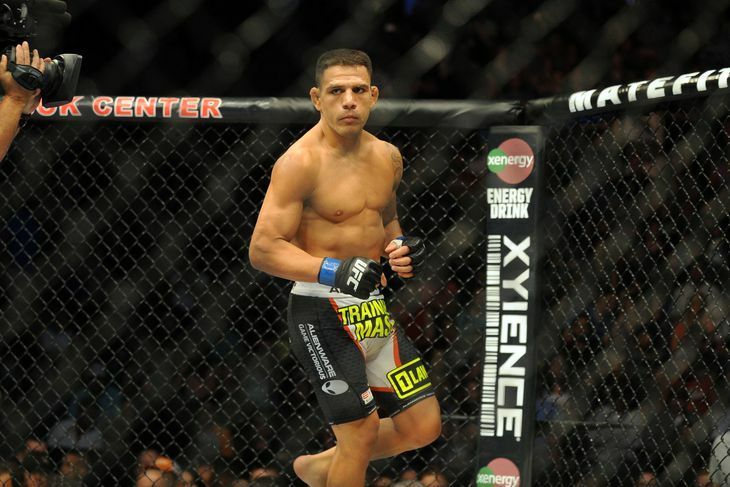 Previewing UFC 185: Pettis vs. Dos Anjos in a double title-fight bill also featuring Hendricks vs. Brown.